Front Sway Bar Diameter (in): 0.875 in. Rear Sway Bar Diameter (in): 0.875 in. Mounting Bracket to Sway Bar Centerline Height: 0.750 in. Overall Sway Bar Bracket Height: 1.750 in. Sway Bar Bracket Maximum Bolt Center to Center: 3.625 in. Sway Bar Bracket Minimum Bolt Center to Center: 2.563 in. Notes: Not recommended for fullsize pickups. 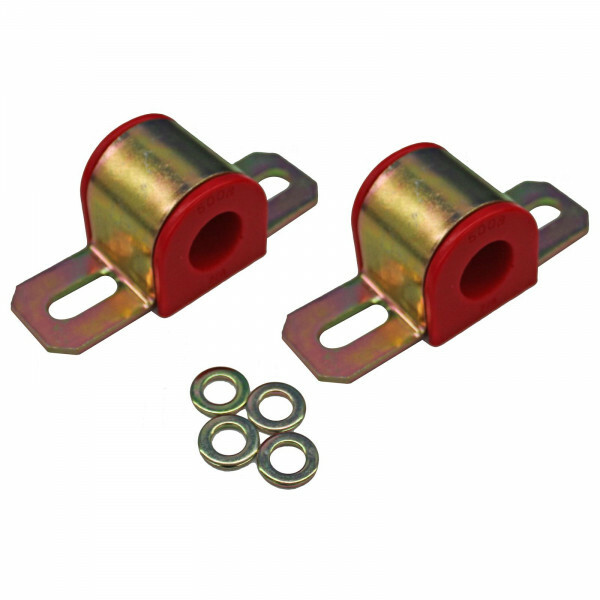 These Energy Suspension Hyper-Flex polyurethane sway bar bushings offer great improvement to your steering performance. They make your vehicle's sway bar system much more effective--almost like adding a larger, higher performance sway bar! Economy, increased efficiency, and easy installation are just some of the reasons that they are so popular.